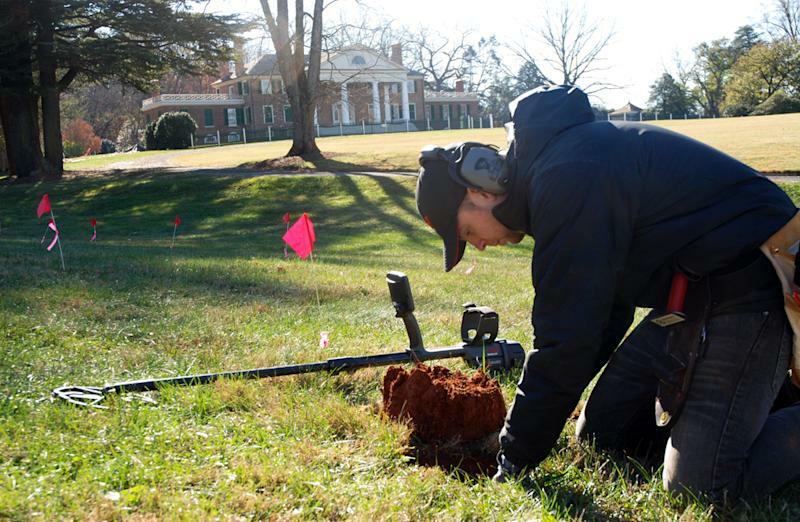 ORANGE, Va. (AP) — In the shadow of James Madison's Montpelier, archaeologists and metal-detecting hobbyists are teaming up to unearth the history that lies beneath the 2,650-acre Virginia estate. "There's always been kind of a disparity. They think we're grave robbers, we think they're overeducated," said 52-year-old Ron Guinazzo, a firefighter from Chicago who has been metal-detecting for 30 years. "But to learn we have the same love of history and to find a common ground where we can work to try and retrieve the artifacts from the ground and put them where they belong, that's the big thing." Guinazzo is one of about 40 people who have participated in a program that began last year that specifically welcomes metal-detector specialists and hobbyists to help uncover areas of historic significance dating to the 18th century. The Montpelier Foundation also invites members of the public to work side by side with its archaeological staff through a separate program. For $750, participants spend a week getting hands-on experience digging at artifact-rich sites while staying at an antebellum plantation house on the Orange County property. Amid the backdrop of the Blue Ridge Mountains, the pastoral landscape is marked with red and blue flags and tied with pink tape as square grids of land are systematically checked using metal detectors costing upward of $23,000. Their blips and beeps identify artifacts such as nails, bits of iron and slag from a blacksmith. The detectors help reveal the type of metal under the ground as well as and its size and depth. The items are then dug up through small holes called plugs that get replaced, leaving little trace the ground had been removed. Later, in a lab, brushes are used to gently clean off the revealed relics. 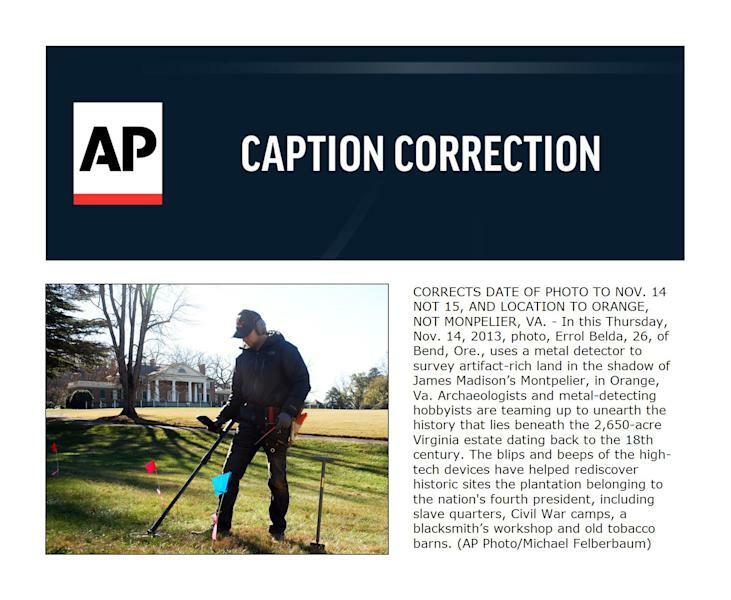 The use of metal detectors has assisted in uncovering several historic sites at the plantation, including elusive slave quarters, Civil War camps, a blacksmith's workshop and old tobacco barns — often found faster than traditional archaeological methods. For example, identifying the area used to cure tobacco would've normally taken three years — it took three months using metal detectors. Madison, known as the Father of the Constitution, spent his childhood at Montpelier and retired there with first lady Dolley Madison in 1817 until his death in 1836. The property changed hands after Dolley Madison's death in 1849. It was bought by the duPont family in 1901 and transferred to the National Trust for Historic Preservation in 1984. In 2000, the Montpelier Foundation became steward of the site, and restoration and archaeological work continues today. Reeves said some archaeologists are opposed to metal detectors working alongside them — they worry the hobbyists will come back to the site and dig. But Reeves said he hopes to change the view of metal detectors and encourage users and hobbyists to become advocates for site preservation. Those who have attended the program have found common ground with their archaeologist counterparts, discovering a mutual respect for their crafts. "To really come back here and be a part of history is just a huge deal," said Errol Belda, 26, of Bend, Ore., who runs a store selling metal detectors after inheriting the interest from his father. "Back home we get these nails, and we just throw them aside. To be able to realize there's history behind that nail shows there's more to it than just finding quarters on the beach."